I know you are not a mayo girl, but I am………..however, I will happily eat potato salad with mustard, vinegar, herbs or whatever! Well I’m happy you posted this! It looks lovely!! I’m rarely ever ahead of the game either, but I do welcome a good potato salad any time of year! I’m a real mayo hater so I’ll definitely be subbing yogurt into this one. That dressing sounds so big on flavor! Once again, you read my mind! 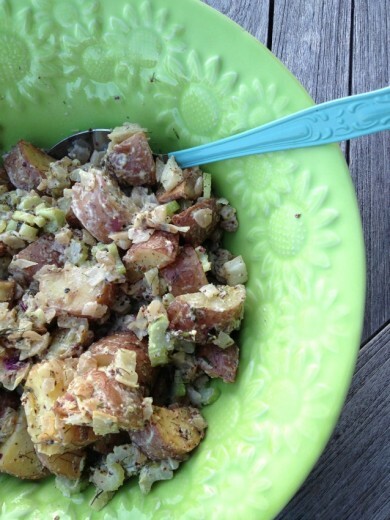 I just printed your potato salad with sugar snaps and tarragon dressing recipe. I was planning to make for a Memorial Day picnic. Hmmm, maybe I’ll try both! I feel your pain. Sometimes I’m on the ball for holiday dishes. Other times…not so much. This potato salad looks like the perfect side dish for the holiday weekend. DId you ever post the recipe for the Strawberry rhubard galette (May 2012)?? I beg of you!! Recipe puhlease. Just the yummy filling- I’ll steal the dough recipe from Deborah Madison. Our strawberries are crazy good right now- Central Coast of California, Dana. You want to come here, too. Darn – I made potato salad a day before reading this and used blue cheese for oomph instead of that lovely mustard and horseradish combo. I did bake rather than boil the potatoes, so they were firm and tasty. Stella, I don’t think I ever did post that recipe. Unfortunately, I have no memory of where I got it! I’m so sorry. Do you guys have rhubarb? I haven’t seen any yet in the Bay Area which is weird for me since it tends to be the first spring “fruit” that we get in Seattle. Way before strawberries. I’d love to check out the central coast! I can never have timely posts, it’s just not in me at all (and I’m okay with that). This potato salad looks amazing – I’m not one for mayo-y dressings and I’m intrigued by the roasted potatoes!